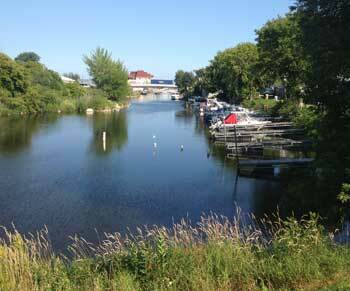 Wisconsin has its share of charming places along Lake Michigan, and Algoma falls under that category. Located just 35 minutes east of Green Bay, this port town welcomes visitors to their sandy beaches, historic downtown, von Stiehl winery, and fun festivals. Algoma can be reached by following the Lake Michigan Circle Tour route on state highway M-42 which runs along the Lake Michigan shoreline starting north of Manitowoc, Wisconsin. M-42 takes you through the communities of Two Rivers, Kewaunee and Algoma, then further north into Door County and the Door Peninsula. 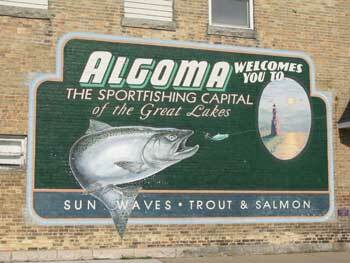 Perhaps the charm of Algoma starts with its location. It's roughly halfway between the busy cities of Green Bay and Sturgeon Bay, just south of Door County...so it's a bit off the beaten path. This makes Algoma a quiet retreat, with shops and restaurants that are very affordable. In fact, the downtown area is very walkable, with interesting shops and small, hometown eateries. You'll notice how historic Algoma is by the brick buildings, where 14 painted murals can be found. Be sure to rise early one morning and view the spectacular sunrise that wakes up friendly folks of Algoma. A perfect place to do this is on the half-mile boardwalk along the Lake Michigan shoreline, which connects the Marina to the Visitors Center. It is handicap accessible at both ends. Crescent Beach is Algoma's most popular beach, and it's right off the boardwalk. This 30 mile trail connects Kewaunee to Sturgeon Bay, and runs through Luxemburg, Casco, and Algoma. The crushed stone trail welcomes hikers and bikers, as well as horses (from April 15-November 15). Dogs are welcome as long as they are leashed, and in the winter, snowmobiling and cross country skiing are allowed on the trails. The Algoma section was once a railway line, and runs along the Ahnapee River where the landscape is beautiful, including marshes, woods, and farmland. Charter fishing on Lake Michigan is as popular in Algoma as many other ports around the lake. Hire a charter captain to take you out on the big lake to fish for salmon, steelhead, and brown trout. These experienced anglers know where to go, have all the latest equipment, and are happy to share their knowledge with you, even if you're a novice. The big Shanty Days Festival is held every August, celebrating the fishing heritage of Algoma. A visit to Algoma will bring you to the sandy beach and the Algoma Pierhead Lighthouse...a steel tower that was founded in 1851. It has gone through many changes throughout the years and started off as a wooden structure. The current red steel lighthouse was relocated to Algoma in 1932 as part of a harbor improvement project. It has a remote control fog signal and was automated in 1973. The Algoma Pierhead has had only six keepers and is now owned by the Coast Guard. The grounds are open to the public but the tower is closed. 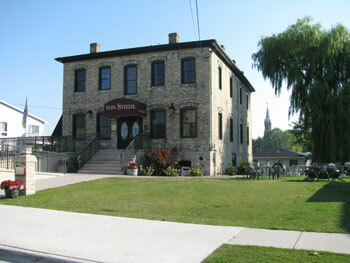 Wisconsin's oldest licensed winery is found right in Algoma...the von Stiehl Winery. Listed on the National Register of Historic Places, the winery is ensconced inside a Civil War-era building. Enjoy spectacular views of Lake Michigan from the outdoor terrace and walk through three limestone tunnels. The 10,000 square foot production facility produces over two dozen award-winning fruit wines. Sample some of these delectable varieties in their wine tasting room....especially their Cabernet Sauvignon and Riesling. Henry Schmiling first opened Ahnapee Brewery in 1868 but went out of business in 1886 due to a hops blight. Now it's coming back to life in the summer of 2013, as head brewer and General Manager Nick Calaway is re-opening Ahnapee Brewery with small batches of full-flavored beers. A tap room in one of the original underground beer vaults will be open for sampling. Algoma is a friendly, laid-back town, and well worth the trip. Make it one of your destinations on the Lake Michigan Circle Tour.